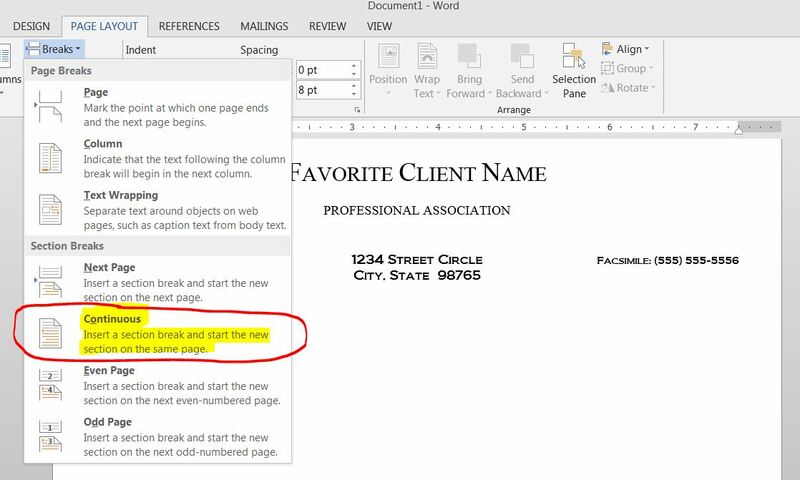 With the cursor just below the faux letterhead content, insert a Continuous section break to separate the letterhead from the rest of the document. In this example, the rest of the document will contain the date, address, re: block, body and closing of the letter. 1. Click the REVIEW Tab of the ribbon to display the “Restrict Editing” tool, in the “Protect” group. 2. 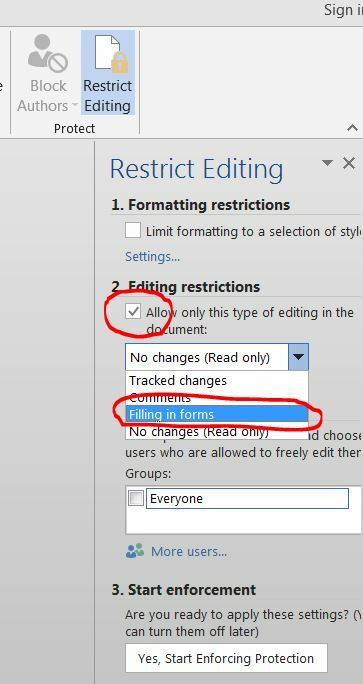 Click “Restrict Editing” and the Restrict Editing task pane will display to the right of the document. 3. 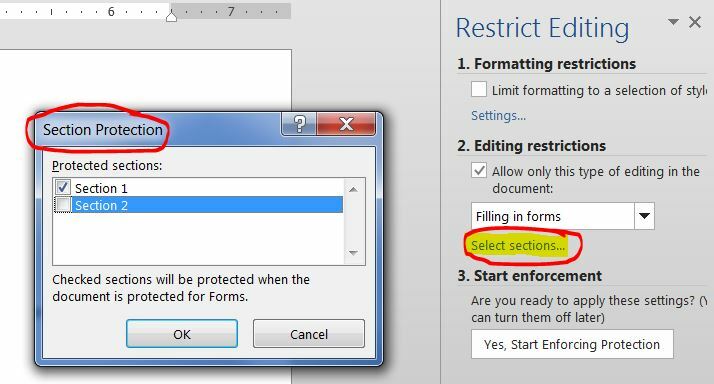 The second section of the Restrict Editing task pane is labeled “Editing Restrictions.” Select the check box. This enables the drop-down list in the section. Choose “Filling in Forms” from the drop-down list. 4. When “Filling in Forms” is selected, Word will display the “Select sections” link under the drop-down list. Click “Select sections” and Word will display the Section Protection dialog box. 5. 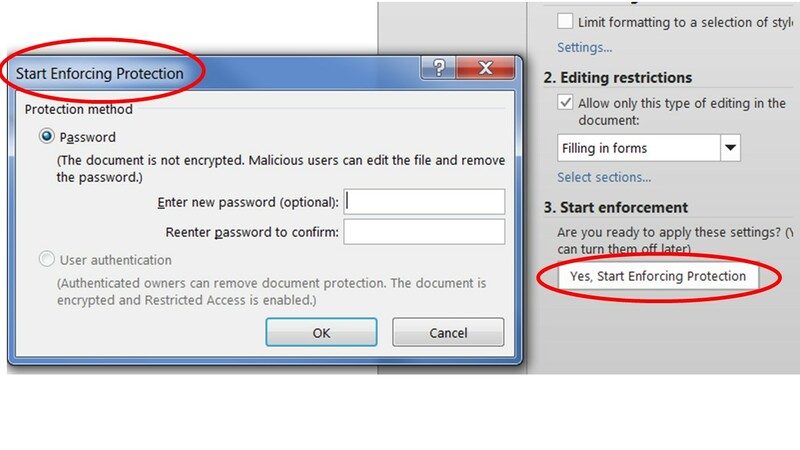 By default, all sections are checked, so UNcheck all sections of the document except the section to be protected and click OK to close the Section Protection dialog box. 6. Back in the “Restrict Editing” task pane, Click “Yes, Start Enforcing Protection” button to display the “Start Enforcing Protection” dialog box. If you prefer, enter a password for the protection and confirm the password by entering it again and click okay. 7. Close the Restrict Editing task pane. The section of the document specified in step 5 is protected.